Moving is never easy, but when you need to move with your cat, it's a whole other level of complication. Whether you're transferring to another state or simply switching to a new apartment across town, you can make the transition easier for both you and your kitty with these handy tips. Make sure wherever you go you have your cats checked out by the vet before you leave. Make sure your cat's shots are up to date, and do this well in advance of your move. Some countries will not accept vaccination records that are only days old, so you will need to check this out too. If your cat is on special medication or food, make sure you get enough to last for at least two weeks, in case you have a problem finding it where you are moving to. Have complete health records for all your pets prior to moving, and if you are traveling out of the country, make sure you get a health certificate. The most important thing is to not make any radical changes in your household or routine before you go. If you are having someone professionally moving you, either board the cats for the day or put them in a room you know the movers will have no occasion to go into. You don't want someone to get lost shooting out an open door because they are afraid of all of the commotion. Make sure you have all their toys, a blanket, their food dishes and their litter box in the room with them. 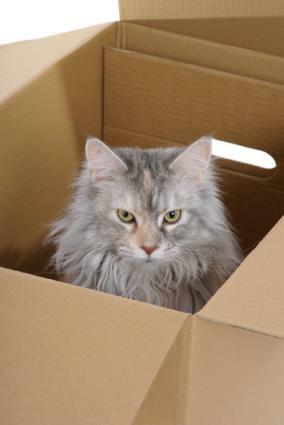 If you are packing yourself, check every box before you tape them shut, so no one gets taped into a box by mistake.Your cat will know something is going on and may begin to act a bit strangely. Don't worry -- this is perfectly normal. Don't pack any of their toys, beds, dishes, blankets or cat trees until the last day. Also, make their things one of the last things you pack, and if you have room, take it with you so it can be one of the first things you unpack in your new home. Make sure you have a food and water dish if going by car. If you are moving multiple cats and have a very large carrier or a crate for them, get dishes that will clamp on the door. These are great because they won't slide around and nothing will spill. Talk to your cat and let him know everything is OK. It really works. You can spoil him more to take his minds off the changes in the house. You can give him more treats or let him sleep with you (if you don't normally do so). This will help Kitty feel better. Most cats will seek some kind of comfort from each other and their owners. If you have a cat that doesn't like to travel, you can get a sedative from your vet. Always test it out before you go - this is very important because you want to know what kind of effect it will have. You could end up with a cat that is wired and bouncing off the walls - and you don't want this. If you're driving your cat yourself and have to spend a night on the road, find out which hotels and motels will allow you to stay there with your cat. Do they charge extra, or have a deposit you have to pay for your pet? Make sure to use your cat's own food and water dishes and take a favorite blanket or bed along with a toy. Make sure you have a litter box for him, and when you get to the hotel room, show him where it is. Get him used to a harness and leash, and include a nametag on the harness that has both the address where you are going and the address and/or phone number of a friend in the old neighborhood in case of any problems. If you are going to fly with your cat, know the rules and regulations for air travel with a pet. Do I need a reservation for my cat? How far in advance do I need to register my cat? How many pets are allowed in the cabin? Do they allow carriers in the cabin with you? Can you get your cat's carrier under your seat, and what are the size requirements for a carrier in the cabin? If your cat has to go in the cargo hold, is there a special place for your pet? Is it pressurized? Are there temperature limitations between which they won't fly animals (i.e. too hot or too cold)? How long before the flight do I have to be there for my pet? Is there somewhere special that I check them in? If the flight is delayed or rerouted, what happens to my pet? Make sure the carrier has a door you can lock or secure somehow, and label the carrier with both your destination and a friend's name and phone number from the old neighborhood. Secure a large plastic bag with copies of your pet's health certificate and a synopsis of their health records. It is very important that you DO NOT feed your cats before you leave, no matter how much they complain. You don't want your cat to get sick in the carrier and not be able to get to them to help. Put a favorite toy or two in the carrier, along with a very soft blanket or piece of rug. If you are using a piece of rug, you might want to use double-stick tape on the bottom of it to keep it in place in the carrier. There are now private companies that will fly your pet for you or deliver them in a van. If you elect to use one of these, do they have a business license and how long have they been in business? Find out if they are bonded, and how long it will take to get your pet to your destination. Some air carriers want you to use a carrier company with an International Air Transport Association affiliation. Every year, many people move to a new country and take their pets with them. This may seem a bit daunting, but can be almost as painless as moving to another town or out of state. You just need to do your homework first. You will want to check with the American Consulate in the country you are moving to and find out if the country you are moving to has any special regulations regarding your pet. If you are moving to another country, will they have to be in quarantine? If so, for how long, and where? If this is the case, know the special food and any medications they might be on, and make sure you take enough with you for the time they might be in quarantine. Ruthie actually found a place she could buy her cat food before she even moved. Will you be allowed to visit them while they are in quarantine? Is there a fee that you will have to pay for their upkeep while in quarantine? Will you have to pay a fee to "import" you pet? Do you have to reserve a place for them if they have to be quarantined? What documents will you need? Do they need any special vaccinations? Does my cat have to go through customs, and if so, how long will it take? This wouldn't normally apply to a cat, but make sure your pet is not on a list of animals banned from entering that country. Do they have any age restrictions? For those of you going to Britian, there is now an organization called the Pet Travel Scheme (PETS), which allows pets from certain countries to enter the UK and Europe without any quarantine. You can check with the PETS website or the British consulate for information. When will my cat have to have its vaccinations renewed? Are there any special health challenges I might need to innoculate for in my new country? What other papers or documents might I need? Is my pet healthy enough to make this move? Is there a time limit for keeping my cat in its carrier? Is there an international organization of veterinarians to make it easier to find one in my new country? Now it's time to get your pet ready for the move. If you are flying, it might be a good idea to take a picture of your pet and make several copies. Take one with you, attach one to the carrier, and if someone else is picking up you pet, make sure they have a copy also, just in case the airline loses your pet. If you are driving your pet, load their carrier into the vehicle last and make sure there is plenty of air space around the carrier so your pet doesn't get overheated. Load in their box of supplies, food, and any special medications you might need on the other end. If you stop at a rest area, make sure your cat gets a break, too. You can let your cat out and allow him to stretch his legs if he'll walk on a leash for you. If there are two or more persons moving, one should stay with your cat at the rest area, while the other one goes in. This way you shouldn't have any mishaps with you cat or other people teasing your cat through the car window. If it is a hot day, you can give your cat a little bit of water by giving them an ice cube. This way they get water and it won't slosh all over the car. If you do your homework and take your time, this can be a fun experience for both you and your cat. As Ruthie told me, the cats were actually the best-behaved ones in the bunch.